Face feed resolution: 0.002 mm by fine feed device. After the semi-finish pass on the diameter grinding, rollers are Taken to datum face grinding. 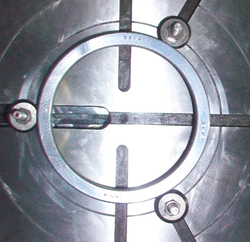 This is a very important operation to control end face run out & end face radius. This influences quality of roller in final diameter grinding pass. X Bar / R chart plotting is used to monitor the roller end face run-out variation. 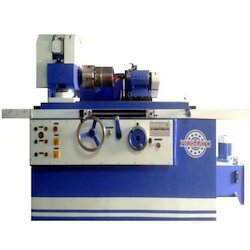 With continuous efforts and experiments we are able to offer high quality Fully Automatic Face Grinding Machine. They are made from high quality material under the supervision of experts. We also provide customized product according to the customers need. CHX840 is a production / resharpening CNC Grinding Machine with a possibility to do Top & Face Grinding machine in single setup. A2-6 spindle nose, flange dog plate, magnetic chuck, chuck and jig fixtures can be mounted suitable for various clamping requirement, spindle head swivel ±90°, suitable for 1mm ~150mm end face grinding. It is also suitable for external cylindrical grinding such as the end face of 3 jaws chuck. Applications: Ideal for face grinding in perpendicular to Dia. 1. for flat circular objects: e. G. Steel centers for diamond tipped circular saws, or for carbide tipped circular saws, hss circular saws, etc. With magnetic chuck. submersible pump bowls/stages face grinding, etc. fully automatic processing & dressing cycle, auto size control. OD And Face Grinding Machine. All Gears are face ground on this machine so as to achieve the required finishing and surface accuracy after Hardening. Voumard 5AP ID and face grinder with lots of toolings and accessories. Machine is imported from europe for resale. Machine is rarely used and in excellent running condition.